We are always on the lookout for new members to write, research, edit, take photos, deliver or simply to come up with new ideas. Do you have skills which could be useful to The Archer? 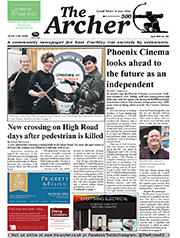 The Archer is a totally independent non-political and non-religious community-run newspaper, based in East Finchley, London, England. It is delivered free every month to 9,500 households in and around London N2. The paper is written, edited, designed, produced and delivered entirely by volunteer members of the community.